The Design Studio often asks, where can you mix it up between the urban, architecture, design, transportation, energy, art and fashion? We find these places of intersection generative and exciting. With the tagline Inhabit: Design will save the world, inhabitat.com described themselves as a “weblog devoted to the future of design, tracking the innovations in technology, practices and materials that are pushing architecture and home design towards a smarter and more sustainable future.” But from solar powered stadiums to foldable compact bicycles, an eco fashion show and an ancient church converted into a modern bookstore, there is a lot to taste here. Re-inventing ordinary street dividers and concrete balls, Liesbet Bussche creates larger-than-life jewelry pieces for the streets of Amsterdam. 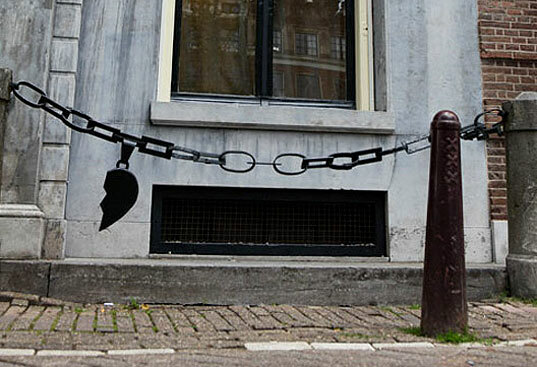 The Belgian designer makes small interventions to the street scape, a charm to a chain or earring backs to a concrete ball. However, altogether the jewelry can easily make any passer-by smile upon finding a serendipitous change in the uniform vocabulary of the urban landscape.